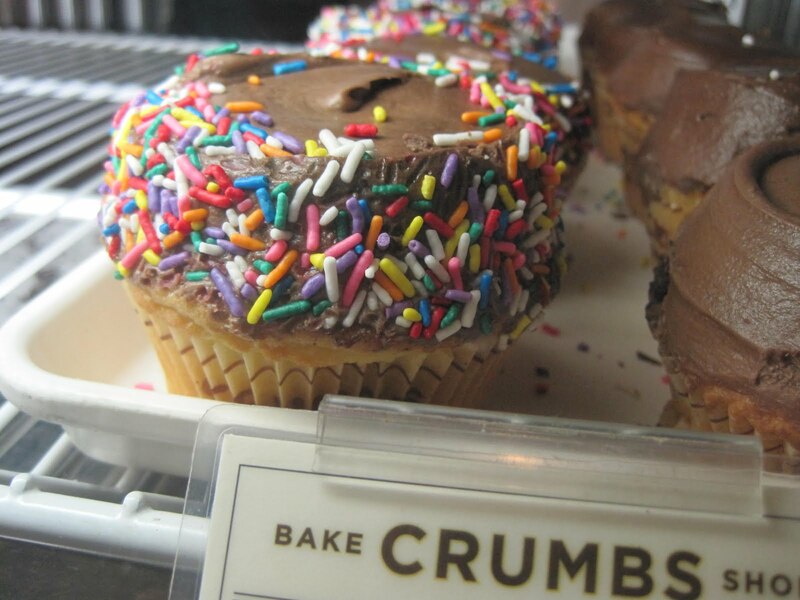 My first trip to Crumbs had me writing them off--the cupcake I tried was dry, too much going on, and in general left me quite disappointed. When Lil Sis was visiting, ABF asked if she'd rather have cupcakes or French pastry (my mind: French Pastry! Millefeuille!) She opted for cupcakes, so we walked to the FiDi outpost of Crumbs. I sighed inwardly but tromped on gamely because, after all, Lil Sis was visiting! Maybe I was in a better frame of mind, but the smell of this place snagged me instantly. 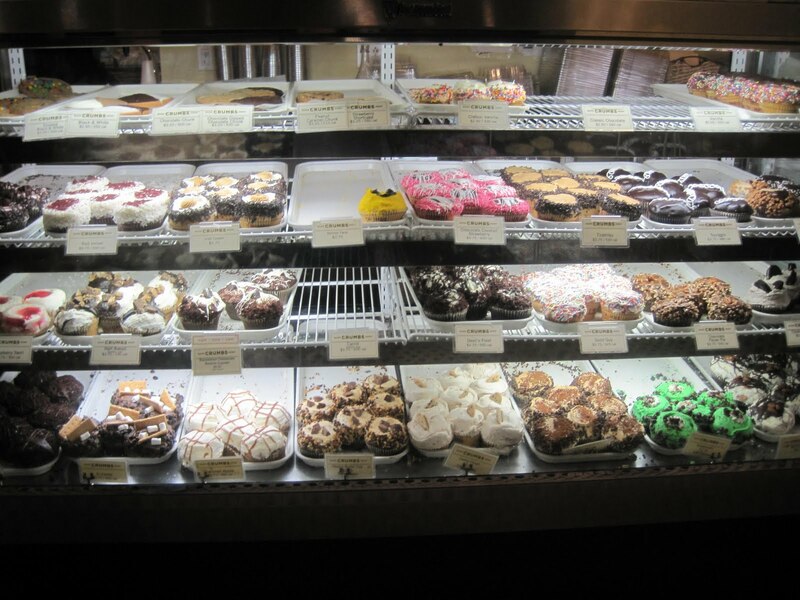 This was the same place where ABF had picked up the chocolate chip cookie dough cupcake we'd halfheartedly shared ages ago, and yet this time smelled....different. Deliciously different. 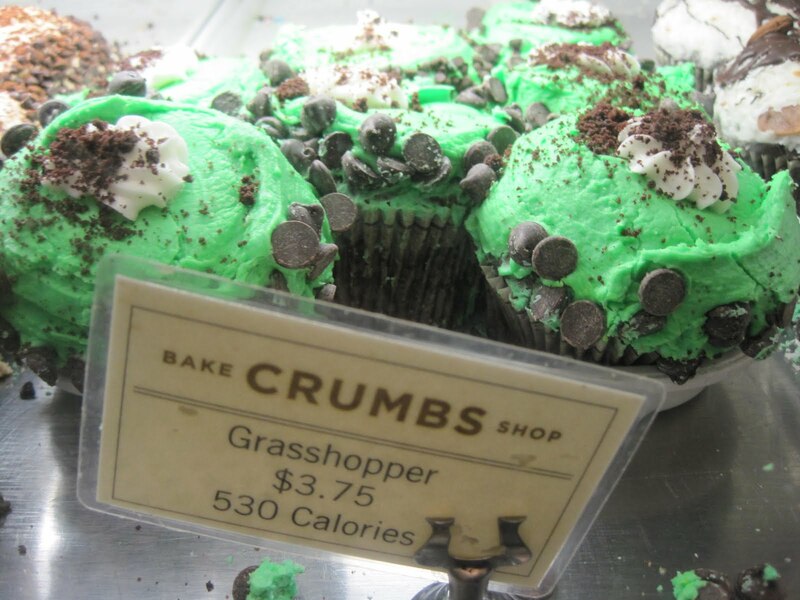 Lil Sis snagged the Grasshopper cupcake (530 calories!? eeep! ), which had devil's food cake with peppermint flavoring and mint icing--I was set on trying some of hers! She kindly obliged to her (bossy) big sister, and I was so glad! 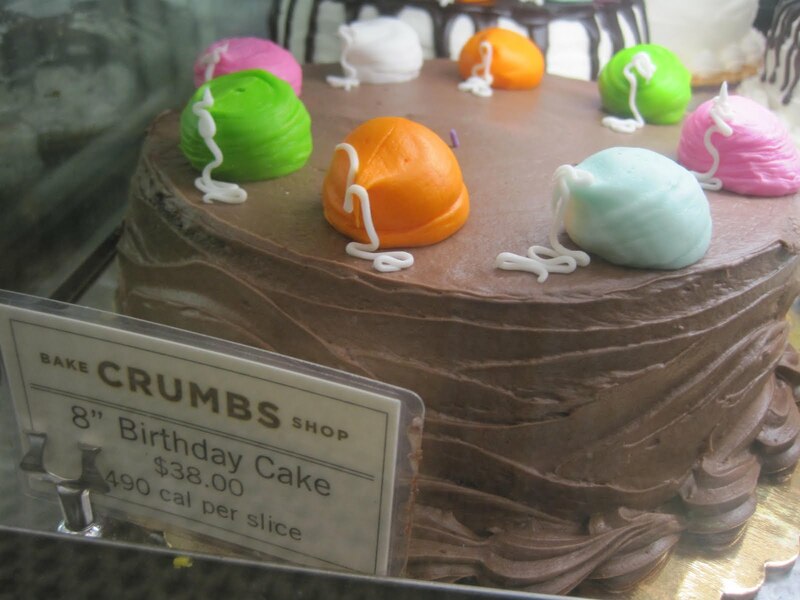 This was superb--rich chocolate, just enough icing, and bits of mini chips on top. Great texture and flavors. Dangit.. 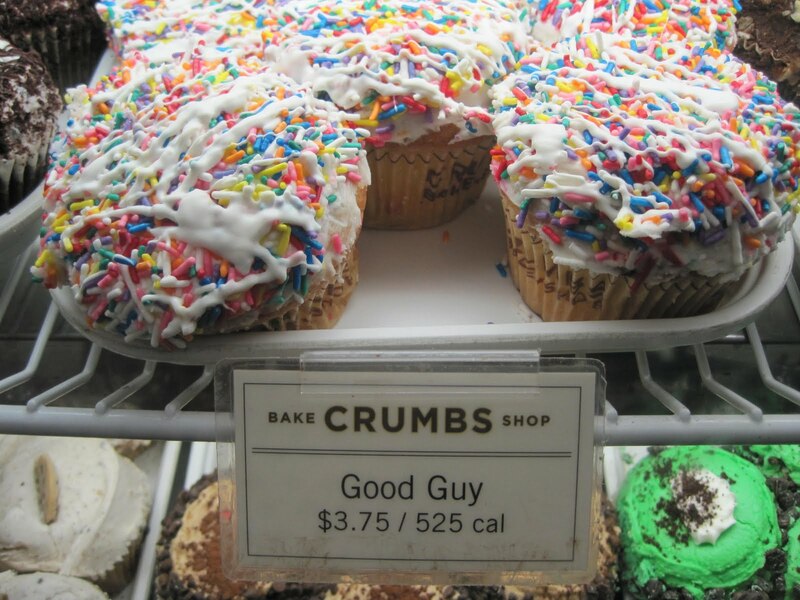 I like Crumbs. 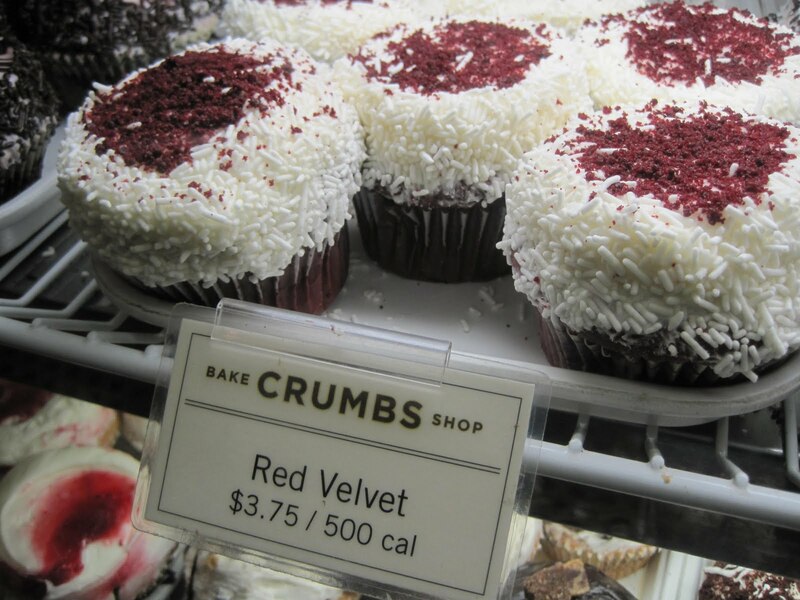 ABF ordered the red velvet, your basic deep rich chocolate cake with a serious dose of food coloring and some creamy, fluffy icing. I felt overwhelmed at first by the dizzyingly colorful cluster o'cupcakes, but eventually settled on the Good Guy, a vanilla cupcake with vanilla buttercream filling and copious amounts of sprinkles. SPRINKLES! This was soft, light cake with a shot of buttercream in the middle that had an almost whipped consistency. I was shocked at how much I liked this cupcake! The sprinkles went everywhere on the ground and it looked like a clown had exploded, but it was well worth the mess (and I'm sure I made some squirrels very happy)! The birthday cakes aren't cheap, but they're cute! I bet they're tasty, too.....has anyone out there tried them? They also have mini ones! The portion sizes are easily double a normal cupcake (hence the larger calorie count), but these are easily shared and will leave you both happy. A nice hot chocolate and/or coffee accompanies the cupcakes nicely! 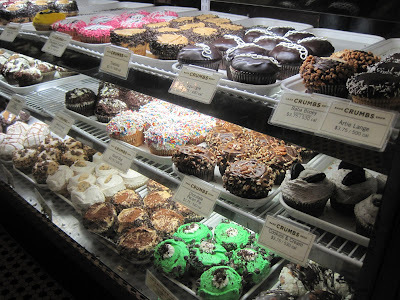 The inside of the store is tiny, so we were forced out into the cold and ate our cupcakes outside, shivering but happy. 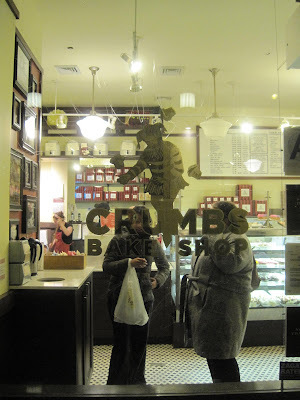 Thank you, ABF, for treating Lil Sis & me to such a sweet treat, and for so gallantly leading us around the Financial District for a top-notch tour! 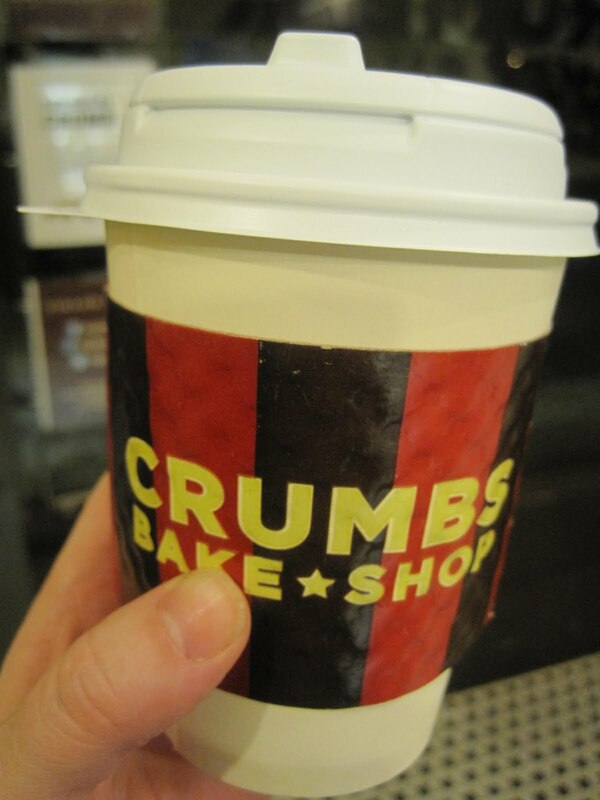 And thank you Crumbs, for teaching me a delicious lesson---always give a cupcake a second chance to make a first impression! I am not a huge cupcake fan, but I am a SUCKER for Crumbs' Caramel Apple. It has apple pie filling! NOM NOM NOM. PS- I think it's quite funny that the Word Verification captcha to comment right now is "caker"
What is with the balloons on that cake?! It looks like someone just globbed up a bunch of icing. Doesn't look very professional to me.